Every time we visit Earth, we always end up disappointing many earthlings because our spaceship is not big enough. So we decided to launch our larger Space station with more satellites and dance-floor units. This way we can satisfy more people and invite more artists who will again deliver the best Techno from around the solar system. This time the commander in chief in the main room, Unit 4, is the mighty Ben Klock. This cosmonaut, famous for his monthly marathon sets at that other space-station for overwhelming techno, Berghain in Berlin, helped create the astronomical reputation of the club. Add to that the album ‘One’ on Ostgut Tone and his Berghain mix as well as the many outstanding releases on his own Klockworks label and you know why he is one of the most revered artists in techno-land for the moment. He will be joined by two veteran techno space travelers from London who have been working more closely together in the last couple of years. Both have an incredible reputation with Mark Broom having produced for world renowned labels such as Mo-Wax, Warp, R&S, Soma, Cocoon, Blueprint and his own label Beard Man. And also James Ruskin is considered as one of the main artists for British techno music. With releases on Coda and Tresor and his own label Blueprint, he set new standards in production techniques and got an excellent universal reputation. Together they will do what they do best, shoot you into hyperspace with their intergalactic techno-beats. 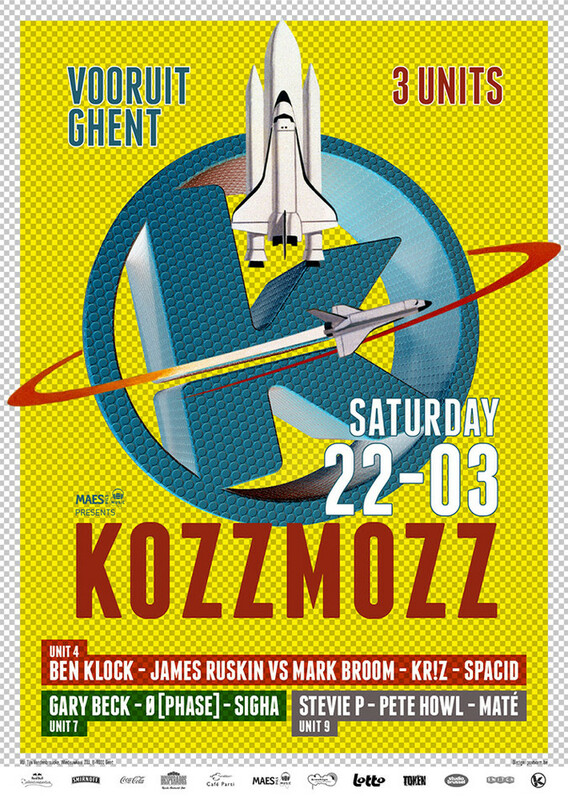 And no Kozzmozz galaxy without our steady space crew ... Spacid to warm up the ship and Kr!z to send you home with a big bang! We hope not before you have visited our other docking stations though ... because also in Unit 7 a great line-up awaits you. Here the magnetic forces will be charged up by Gary Beck who’s one of the closely watched artists of the moment, now that his own BEK Audio, with a back catalogue of artists such as Mr. G, Dj Rush, Mark Broom & Speedy J, has developed into a very strong techno label. Next up is one of Kriz’ Token Records leading bright stars with Phase. His debut album on Token, ‘Frames of Reference’ stunned the world and received raving reviews. Off course, also all his other productions for Token were already a hit, especially the ‘Morodem EP’ which later got rereleased with two remixes of Ben Sims and ‘Binary Opposition’. No less than 3 international stars in room two with newcomer Sigha, known for his releases on Hotflush & Blueprint and remixes for labels as CLR, Token and Perc Tracks to name but a few. His own Circula Records has also already stirred up very energetic waves in the universe. We are also very delighted to welcome our sister event Peep to Unit 9 where we will be transmitting more house influenced sounds and where we will explore the thin line between house and techno. We will do this with some of the outstanding talents from that little town called Ghent. We start up the engine with Maté from the hip Nachtvogels events and continue our space flight with Pete Howl from Decadance and Stevie P who has records out on Thrill Recordings, StirSound and Mowar, amongst others. A young talent you should watch out for as he will be breaking through the sound barriers for sure. All these guests will bring you in a new state of consciousness warping your mind through portals to worlds beyond your earthly imagination. So dear mortals, follow the white dwarf and celebrate the cosmic dance. Surrender to the true Masters of the Universe and enjoy the Flight!